Probably my most favorite video games are thrustlike games – as in roguelikes begat by Rogue (ADOM, Nethack, Angband, Moria et al.). 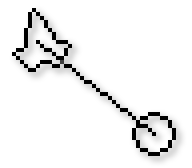 What I mean with a thrustlike is a game derivative of Asteroids, Lunar Lander, Gravitar and Spacewar that feature a simple physics model, a rotating spaceship and a button for thrust. Hence, “thrustlike” and not “gravitarlike”. Also, mostly because I really like Thrust. Here are some of the games I consider the best examples of this genre. What I think Thrust does that makes it so much better than Asteroids and other household names is that it takes the simple rule of motion and inertia, and adds another basic concept, counterforce. In Thrust, you not only maneuver the ship through narrow caves but you also have to lift a heavy load (a “klystron pod”) that swings under the ship. And, in most cases the roles are reversed when the heavy pod transfers its excess kinetic energy to your stationary ship, sending you both spinning towards the nearest wall. However, the whole gameplay doesn’t feel as random as it is with many modern physics based games that often require luck or endless trial and error. You are always in charge of the physics, if you are a good enough pilot. Another thing that I like about Thrust is that the player is easily able to skip a few levels by activating the self-destruct sequence of the planet by shooting the power plant a few too many times. Why I like it is that in a way you feel like you cheated the game (although, you also lost a lot of bonus points). However, without a doubt this was added to make it easier to quickly get to and practice the later levels, it’s a very nice touch it’s built in the game world. It is also possible to get hefty bonus if you manage to both fetch the pod and also destroy the power plant. Thrust has a reputation for being hard but I can’t really agree with that. The game has a handful of levels and the regular levels are quite easy to finish when you get the hang of it. 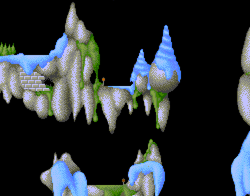 However, after that the gravity is reversed and the levels loop from the beginning and after a successful completion, the walls turn invisible. And then I guess the game goes reversed-invisible1. Another proof of the game’s excellence is that it’s probably one of the most ported (officially or not) games, when it comes to radically different platforms. There are equally playable versions for the BBC (also the original version), the C64 (with a rocking Hubbard tune), the 8 and 16-bit Ataris and unofficial ports for Vectrex and Atari VCS2. There also is a C rewrite of the game engine that is open source, which I guess ensures the game can be ported to any semi-modern platform. There apparently was a sequel, that wasn’t so well received (proving more does not equal better) and I have never seen it. Gravitar, on the other hand, does much of the same. Thrust (1986) was obviously very influenced by Gravitar (1982)3, which was probably influenced by Asteroids (1979) and Lunar Lander (1973, 1979). Both Thrust and Gravitar have planets to visit, fuel to be beamed up, enemy bunkers that shoot back and, of course, gravity. But to me, Gravitar doesn’t have as crystallized gameplay as Thrust. Thrust is as solid as, uh, Gravitar’s vectors are, umm, sharp. What’s pretty neat in Gravitar is that you can select in which order you play the levels, the levels are simply presented as planets in a solar system and you have to fly the ship avoiding the star that is in the center of the solar system. This also gives another challenge (or a possibility to optimize your gameplay) since the star’s gravity can be exploited to save fuel. Each level also is quite different from the other levels. Another game I really liked was Oids. It combines yet more favorites of mine with Thrust: Choplifter and Space Taxi, both outside the strictest requirements of the thrustlike genre. In Oids, the klystron pods are replaced with little guys (android slaves, or ‘oids) that you have to pick up, first of course having to land the ship carefully, and take up to the mothership. Oids is so loved that the Atari ST emulator Oidemu was made just to run the game, which wouldn’t run on other emulators — and Oidemu subsequently didn’t bother supporting any other games. The saving the little guys idea is lifted from Choplifter (get it?) in which you use a chopper to demolish prisons and then land nearby and wait for the little men to climb aboard, making multiple runs as the chopper can carry a limited amount of men. The gameplay is much speedier in Oids, you constantly have to dodge incoming bullets and homing missiles and the levels generally are much more open than in Thrust or Gravitar. In all, Oids feels like very natural progression from Thrust. Maybe one factor that made the game so special was the fact it shipped with a level editor. If we bend the rules what makes a thrustlike, Space Taxi is more than a worthy addition to the genre. Especially so, if you think Lunar Lander fits in the genre — both games have similar controls (thrust up, down and to the sides) and also the common goal of landing quickly yet safely. There was a nice clone of Space Taxi on the Amiga featuring a caveman flying a stone-age version of a helicopter (think Flintstones). The game was called Ugh! and it was later ported to the PC (it’s great) and C64 (it’s crap). While Ugh! looks gorgeous and is fun to play, what Space Taxi does infinitely better is that every level in Space Taxi is very different from the other levels, and that is not just the layout that changes (on top of that Ugh! uses the same tiles over and over, however nicely pixeled they might be). The rules of the game are often deviated slightly. For example, one level has a beanstalk that slowly grows leaves on which you can land (and the passengers start appearing on) and others simply have disappearing walls or teleports. I guess that still makes the game quite unique, since even now games rarely have radically different levels. There also is Space Taxi 2, which is a legit sequel but the tiny voice in my head says it can’t possibly measure up. It’s worth a check, though, as it has the same level designs as the original. Solar Jetman: Hunt for the Golden Warpship is pretty much exactly what Thrust was years earlier but with updated graphics. The only difference is that in each level you have to find a different object, each being a part of the Golden Warpship and various other items which upgrade the ship you pilot around. There’s also a bit of Oids in the game, as it features more shooting and has enemies that follow you around the level. The game provides welcome variation to NES games and I can see why it wasn’t a success among the younger gamers despite the great graphics (got to love the smooth rotation of the ship). The controls are smooth but as all games of this genre, Solar Jetman can be a handful. Especially, if you are looking for more straight-forward action. The game is the successor to Lunar Jetman (which shares only half of the name and virtually no gameplay elements, except for the little spaceman that you have to get back to the mothership when your probe is destroyed, see above video) — Solar Jetman was developed by Rare who in fact were called Ultimate Play The Game who developed Lunar Jetman for the Speccy (and loads of other very successful games). Solar Jetman was also going to be released for most of the home computers of the time but the ports were canceled and only the C64 port is available to the public. In the mid-1990s there was a boom for so called caveflyers (from Finnish “luolalentely”) here in Finland. The caveflyer genre probably owes more to Spacewar as it’s mainly about blowing up the other players. There were dozens of similar games that all featured hotseat multiplayer action (some even had computer controlled), various weapons and levels and most importantly destructible environments. There had been a lot of similar games by hobbyists before the boom, the single game that started it all probably was Gravity Force on the Amiga. However, I think the flood of cavefliers (in Finland, at least) was triggered by Auts and Turboraketti on the PC. I am very sure different areas had a bit different ideas what was the hottest game but at least to me, Auts was it. After that more and more clones started appearing with constantly improving quality and broadening weapon arsenal. My favorite probably was Kaboom. On the Amiga, there was a bit older similar game called Mayhem (1993) which we played a lot. There’s an abandoned PC conversion that you can find in the linked thread. This subgenre is still alive and there are many modern caveflyers that have Internet multiplayer features and so on. 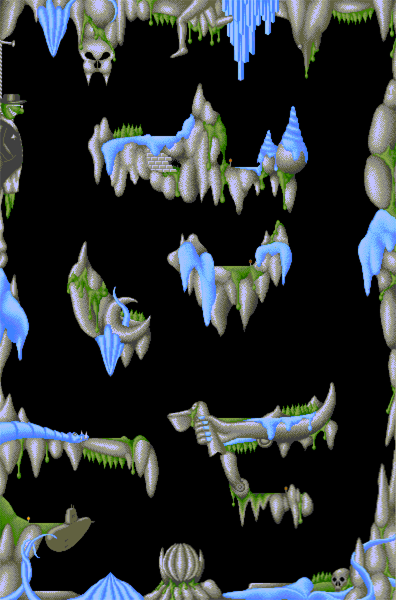 There have been various Zarch (1987) on the Acorn Archimedes (ported later in 1998 as Virus for the Amiga, Atari ST, ZX Spectrum and PC) features similar controls for the player ship except that there now are two rotation axes. The gameplay however features minimal interaction with the landscape as there are no caves. Later in 1999, Psygnosis released Lander for the PC that featured closed levels, cargo hauling and teleporting fuel on the lander. So, Lander pretty much is Thrust in 3D. So, were there any games I left out that you think should be here? Do leave a comment. Also, I’d like to thank the people who uploaded gameplay videos of Thrust, Gravitar and Oids to Youtube. I had only a NES emulator with AVI output handy.